social media and internet gaming: http://bit.ly/addictionsaferemr. "More than 100 child advocates, civil society groups, medical experts and other individuals are urging Facebook to discontinue its Messenger app for kids, alleging that the software poses health and development risks to children. Organized by the Campaign for a Commercial-Free Childhood, nineteen groups, including Common Sense Media and Public Citizen, have signed a letter to Facebook chief executive Mark Zuckerberg that will be sent on Tuesday. The initiative is the latest example of critics opposing early adoption of digital technology and is playing out amid a broader backlash against the rising influence of Silicon Valley. The signatories said children are not prepared for online relationships and lack an understanding of privacy and the appropriateness of sharing texts, pictures and videos. Citing research that suggests a link between social media use and higher rates of depression among teens, the letter states it would be irresponsible for Facebook to expose preschool-aged children to a similar service. In addition, the signatories expressed concerns over boosting the screen time of young children and said this would interfere with crucial developmental skills such as reading human emotion, delaying gratification and engaging with the physical world." 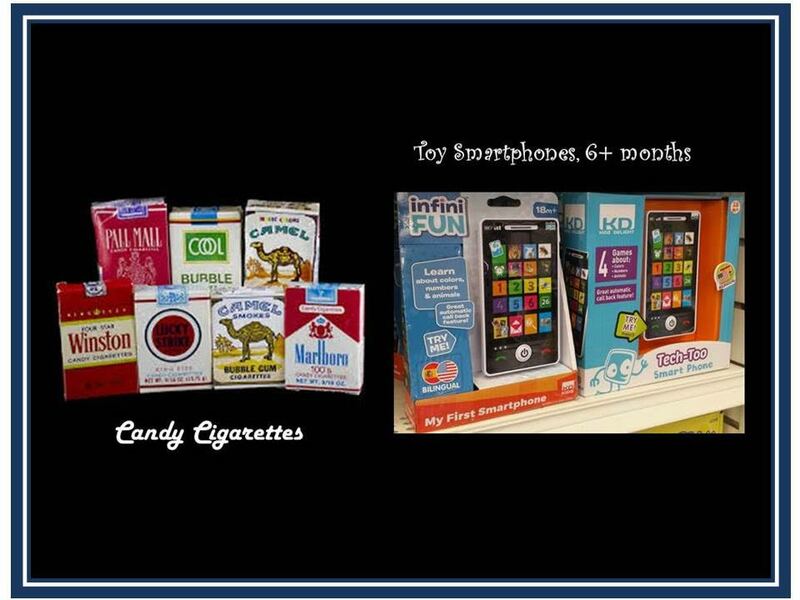 Is the smart phone the cigarette of the 21st century? 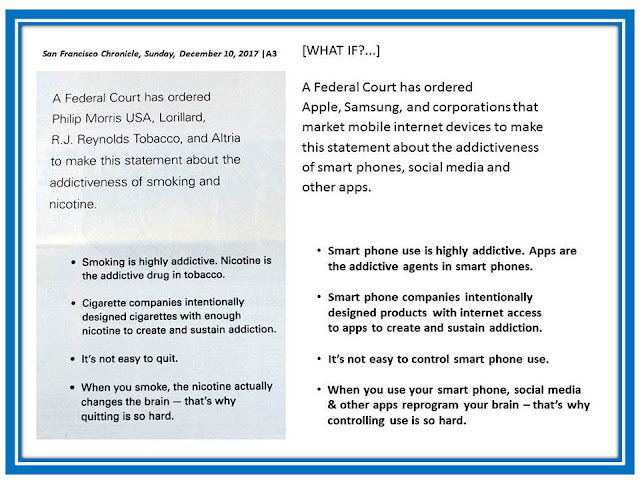 Yesterday cigarette companies published the following notice in major newspapers in the U.S. as part of a year-long counter-advertising campaign to comply with a Federal court order. 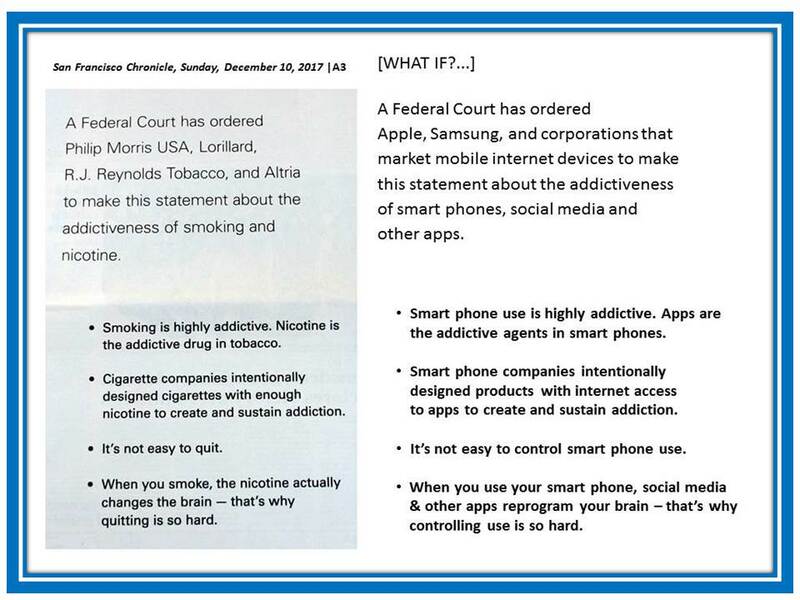 What if the courts decide some day that the smart phone is the 21st century cigarette -- might we see the following smart phone ad? During the past year, I've done several reviews of papers submitted to journals that examined smartphone addiction among young adults. The studies were conducted in different countries. The wireless industry claims to have sold more than one billion smartphones last year. Thus smartphone addiction is quickly becoming a global public health issue. Now for some anecdotal observations ... 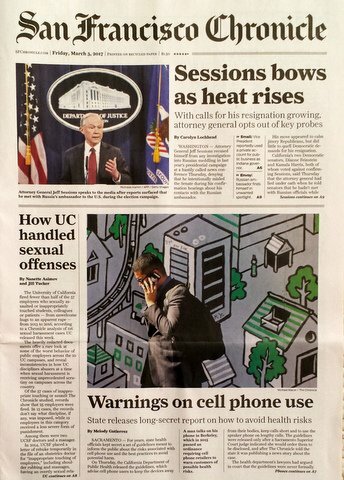 Yesterday, I observed student cell phone-related behavior while walking across the UC Berkeley campus to do a lecture on the health risks of cell phones. More than half of the students I passed were carrying or connected to a smart phone. Eighteen students carried the smart phone in their hand while they walked and were not using it. Eighteen students were wearing a wired headset connected to a device in their pants pocket. I could not tell whether or how they were using this device (which was likely a smart phone) as I kept walking. Finally, seven students were on a phone call holding their smart phone next to their ear. While waiting outside a lecture hall for the prior class to leave, I observed many undergraduates browsing their smartphones to fill the time before their next class. As the lecture hall emptied out, many students pulled out their smartphones as soon as they exited the hall. If we rolled the clock back to 1960, what would I have observed walking across campus? Would many of the students I described above been smoking cigarettes? Have we substituted one addiction for an another? Has the smart phone replaced the cigarette? BTW, I am proud to say that the UC Berkeley campus, along with the other UC campuses, has a tobacco-free policy. I did not observe any tobacco use on my trek across campus. Your smartphone is making you stupid, antisocial and unhealthy. So why can't you put it down? Eric Andrew-Gee, The Globe and Mail, Jan 6, 2018. Does smartphone addiction show up in teen’s brains? In June, 2009, the Division of Environmental and Occupational Disease Control in the California Department of Public Health (CDPH) prepared a draft cell phone safety guidance document. Although the document reflected the consensus of the division, it was not released until May, 2017 pursuant to a court order--the outcome of a lawsuit filed under the California Public Records Act. In December, 2017, the CDPH finally published their cellphone safety guidance document. A side-by-side comparison of the contents of the original 2009 draft with the 2017 published version of the document appears below. The side-by-side can be downloaded at http://bit.ly/CDPHsidebyside. To date more than 100 domestic and 130 foreign news stories have been published regarding the California Department of Public Health's cell phone radiation safety guidance. The safety warnings have received media coverage in 48 countries. For more information about the cell phone safety document see my post, "Cell Phone Safety Guidance from the California Public Health Department." Following are links to the news stories. How worried do we need to be about cell phone radiation? Editorial: What is the risk of using a cellphone? California Issues Warning About Cell Phone Radiation. Should We Freak Out? California is worried about cell phone radiation--should you be too? California Just Issued A Warning About Cell-Phone Radiation—How Worried Should You Be? Is California Hiding the Risks of Cell Phone Use? The following radio stations reported news about this story: KABC (Culver City), KATD (Sacramento), KCBS (San Francisco), KIQI (San Francisco), KPFA (Berkeley), and KWFS (Wichita Falls, TX).